Barbara Bel Geddes (October 31, 1922 – August 8, 2005) was an American actress, artist, and children's author, whose career spanned six decades. She was best known for her starring role in the television drama series Dallas as matriarch Miss Ellie Ewing. Bel Geddes also starred in the original Broadway production of Cat on a Hot Tin Roof in the role of Maggie. Her notable films included Alfred Hitchcock's Vertigo (1958) and I Remember Mama (1948). She was the recipient of several acting awards and nominations throughout her career. Bel Geddes was born on October 31, 1922, in New York City, the daughter of Helen Belle (née Schneider) and stage and industrial designer Norman Bel Geddes. She married theatrical manager Carl Sawyer (né Schreuer) in 1944; they had one daughter, Susan. They divorced in 1951. Later that year, she married stage director Windsor Lewis, with whom she had a daughter, Betsy. When Lewis became ill in 1967, Bel Geddes suspended her career to care for him until his death in 1972. Bel Geddes came to prominence in the 1946 Broadway production of Deep Are The Roots. The performance garnered her the Clarence Derwent Award, and the Donaldson Award (forerunner of the Tony Awards) presented to her by Laurette Taylor, for "Outstanding Achievement in The Theatre". From 1951 to 1953, Bel Geddes played 924 performances of the F. Hugh Herbert hit comedy The Moon Is Blue. In 1955, she created the role of Maggie "The Cat" in Elia Kazan's original Broadway production of Tennessee Williams' Cat on a Hot Tin Roof, and in 1961 created the title role in the Jean Kerr comedy Mary, Mary which became Broadway's longest-running show with over 1,500 performances. Both roles earned her Tony Award nominations. Other highlights include John Steinbeck's Burning Bright, Edward Albee's Everything in the Garden, and Silent Night, Lonely Night with Henry Fonda. In 1952, she received the prestigious "Woman of the Year" Award from Harvard University's Hasty Pudding Theatricals, America's oldest theater company; In 1993, having appeared in 15 Broadway productions, she was inducted into the American Theater Hall of Fame (located in the Gershwin Theatre in New York City), a distinction she shared with her father, stage and industrial designer Norman Bel Geddes. Bel Geddes began her film career starring with Henry Fonda in The Long Night (1947), a remake of the 1939 French film Le Jour Se Lève. "I went out to California awfully young," she remarked. "I remember Lillian Hellman and Elia Kazan telling me, 'Don't go, learn your craft.' But I loved films." The following year, she was nominated for an Academy Award for Best Supporting Actress for her performance in the George Stevens classic film I Remember Mama. She played Richard Widmark's wife Nancy in Kazan's 1950 film noir Panic in the Streets. In 1958, Alfred Hitchcock cast her with James Stewart in Vertigo as the long-suffering bohemian, Midge. Bel Geddes also starred with Danny Kaye and Louis Armstrong in the screen musical The Five Pennies. When an investigation from the House Un-American Activities Committee saw Bel Geddes' name put on the Hollywood blacklist during the 1950s, it stalled her film career for a time, and she carried on with her acting on Broadway, and an occasional part on television. Bel Geddes found new opportunity in television when Alfred Hitchcock cast her in four episodes of Alfred Hitchcock Presents, including "Lamb to the Slaughter", in which she played a housewife who killed her husband by bludgeoning him to death with a frozen leg of lamb, cooking the murder weapon, and then serving it to the investigating police. She appeared in series such as Playhouse 90, CBS Playhouse, Riverboat, Dr. Kildare, and Death Valley Days. In 1977, she starred in the highly acclaimed production of the Thornton Wilder classic, Our Town with Hal Holbrook. In 1978, Bel Geddes was the first artist signed to star in Dallas. The role of the family matriarch, Miss Ellie, brought her renewed international recognition. She appeared on the series from 1978 to 1990 (absent during the 1984–85 season) and remains the only cast member to win the Emmy Award (Primetime Emmy Award for Outstanding Lead Actress - Drama Series) and the Golden Globe (List of Golden Globe Awards: Television, Best Actress, Drama). In 1985, she also received Germany's Golden Camera Award. Larry Hagman, who played J. R. Ewing, told the Associated Press: "She was the rock of Dallas. She was just a really nice woman and a wonderful actress. She was kind of the glue that held the whole thing together." In a later interview for the website "Ultimate Dallas", Hagman said, "The reason I took the show, they said Barbara Bel Geddes is going to play your mother, and I said, 'Well, that's a touch of class, you know,' so of course I wanted to work with her." In the early 1970s, Bel Geddes underwent a radical mastectomy, an experience she relived in the 1979–80 season of Dallas. The performance garnered her the Emmy Award. She was also honored by former First Lady, Betty Ford, for helping to raise breast cancer awareness. On March 15, 1983, Bel Geddes narrowly avoided a heart attack when her doctor discovered a condition requiring emergency quadruple bypass surgery only days after filming was completed for the 1982–83 season. (News reports to the contrary, she did not have a heart attack.) As a result, she missed the first 11 episodes of the 1983–84 season and was replaced with actress Donna Reed for the 1984–85 season. With her health improved, CBS-TV persuaded Lorimar Productions to return Bel Geddes to the role of Miss Ellie for the 1985–86 season. She remained in the role until the later stages of the penultimate season of Dallas in 1990. Bel Geddes retired from acting in 1990 and settled in her home in Northeast Harbor, Maine, where she continued to work as a fine artist. She was the author of two children's books, I Like to Be Me and So Do I, as well as the creator of a popular line of greeting cards. Looking back on her career, Bel Geddes told People: "They're always making me play well-bred ladies. I'm not very well bred, and I'm not much of a lady." Bel Geddes died on August 8, 2005, at her home in Northeast Harbor at the age of 82. Upon her death, she was cremated, and her ashes were scattered from a simple wooden boat into the harbor waters bordering her estate in Northeast Harbor, Maine. At the revival of Dallas, Patrick Duffy, who played her youngest son, Bobby, in the original CBS Dallas series, said: "Barbara is a big piece of our history, and it's important to me to honor her. To come back with Linda Gray as Sue Ellen and Larry Hagman in his J.R. hat, and then see the words Ellie Southworth Ewing Farlow on the gravestone made me think, 'Oh, that's right -- she's gone." "Through the whole first season, I don't think an episode goes by that Mama is not mentioned in reference to Southfork and the land." ↑ The Midwestern Roots of Barbara Bel Geddes, genealogymagazine.com; accessed January 27, 2014. 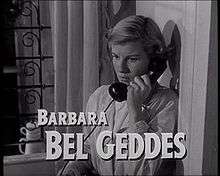 1 2 3 Barbara Bel Geddes- Biography Archived January 16, 2013, at the Wayback Machine., Yahoo! ↑ "Barbara Bel Geddes has open heart operation". Associated Press (AP), printed in The New York Times (.com). March 15, 1983. Retrieved March 16, 2016. ↑ Actress Barbara Bel Geddes has died, MSNBC, August 10, 2005. Wikimedia Commons has media related to Barbara Bel Geddes. 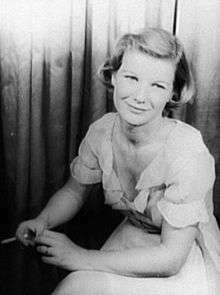 "Barbara Bel Geddes". Find a Grave. Retrieved August 10, 2010.